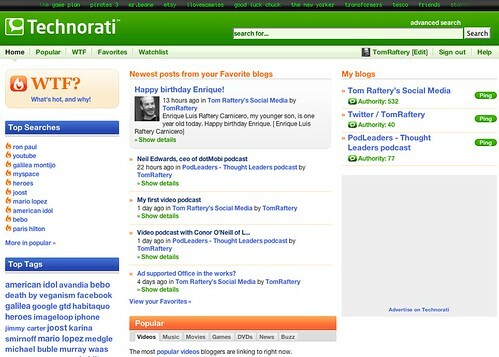 Technorati have overhauled their site completely. Some of the changes are great and some we could do without, frankly! The best change is that they have drastically sped up the site. I dunno did they add more servers or simply optimise their queries (I suspect the latter) but the site and particularly searches are now running a whole lot faster. The next great change is that they have moved the blog searches to a page of its own. You can now find blog searches at s.technorati.com. The searches return relevant results and make subscribing to searches a whole lot easier than heretofore. On the downside, on the main Technorati page they have a scrolling bar of tags along the top – make it stop! I thought we had killed of the Marquee tag people!!! Overall, the new design seems to be getting the thumbs up from most reviewers. This can only be good as with the rollout of Google’s excellent Blogsearch tool, reasons for using Technorati were becoming fewer and fewer. Google now controls more of my info! I wasn’t being entirely serious when I said that! I did realise they weren’t using the tag. The effect is similar though. Either way I have to say I think it looks awful. Actually the whole landing page in general is horrible. I can’t imagine the current look staying in place for very long.